When is a food company not a food company? A crowded room, too narrow for the number of people jostling for tea, coffee and the pastries on offer. A chance for people from the food industry to mingle with university researchers and find common ground. A chance for academics to win serious money, and companies to influence how that money would be spent. It was a Knowledge Transfer Network (KTN) meeting, set up by InnovateUK. What could be wrong with that? A lot, as it turns out. This occasion was a couple or so years back that I’ve written about before, and told the story of a weird conversation, (one of many that day) about a desire to make a choc bar stimulate the same physiological response as a sprig of broccoli. Who were the ‘food industry’ companies represented at this meeting? Not the likes of farmer Simon Beckett, nor fruit and veg wholesaler, Parveen Mehta, as the profit margins in their part of the food sector are slim, sometimes not profitable at all. You’ve guessed it, the people at this KTN meeting were from the big global corporations, representatives from the sector’s biggest global businesses, including more than a few from the companies on this Forbes list. 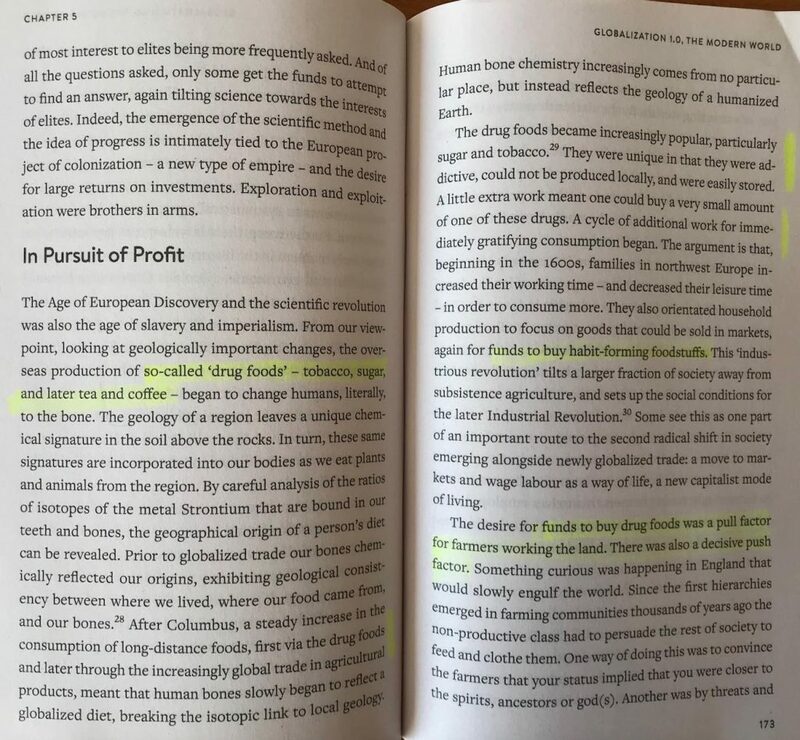 It was only when I read the words ‘drug-foods’ in Simon Lewis and Mark Maslin’s The Human Planet: How we created the Anthropocene that I had an inkling as to why. Take a look at this extract (left). Two phrases leapt out at me: “Tobacco, sugar, and later tea and coffee” and “habit-forming foodstuffs“. As well as sugar, we can add in artificial sweeteners because of their physiological effects. We can add in cacao products as well; i.e. chocolate in its various forms. There’s alcohol, too, though not on Lewis and Maslin’s list as booze in various forms was around in Europe long before Columbus set sail. With these drug-foods in mind, take another look at the Forbes List. Nearly all are in drug-food businesses directly or use drug-foods within their formulations. 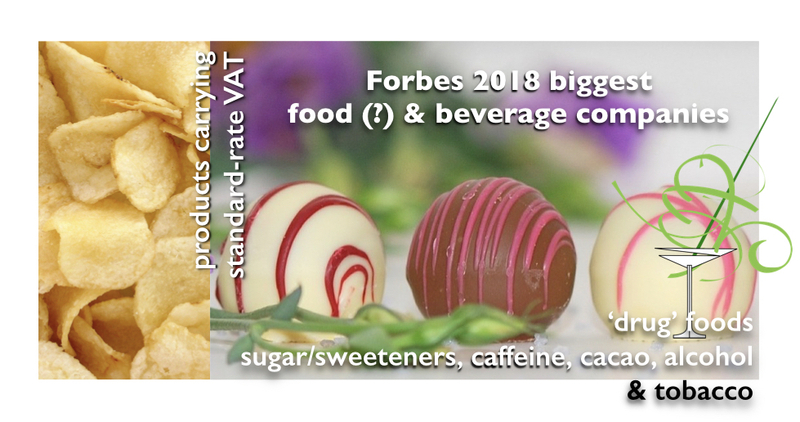 Here at the Birmingham Food Council, we’ve already identified VAT as a useful point of sale (POS) metric to identify food and drink products that have zero or close to zero nutritional value. Nearly all drug-foods carry standard rate VAT; an exception is loose tea and coffee. Not all VAT standard-rated products are drug-foods. Crisps and savoury snacks carry (currently) 20% VAT, but many do not contain one of the drug-foods. There’s a big spend, though, on research to find formulations that stimulate sensations of pleasure; take, for example, this Institute of Physics blogpost on Where’s the physics in making the humble potato crisp that we all know and love? * about research sponsored by PepsiCo, owners of Walker’s crips. On that last PepsiCo-Walkers matter, see also our blogpost Spuds or Crisps? Which is better for you and better for global food security? See, too, this blogpost Let them eat chocolate? on how global vested interests operate on governments and institutions, including university research. And so to the first of two other questions that need to be asked about the dominance of these companies in the sector. What is the impact of the production of these ‘foods’ on the increasingly scarce resources of land, soils (and soil nutrients), water and energy which could otherwise be used to grow nutritious food for the world’s growing population? 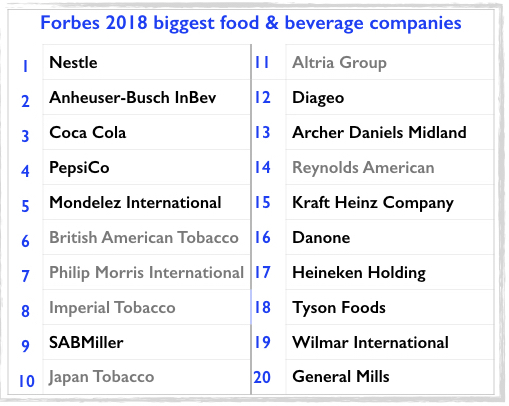 Is it time to treat these global corporations as we do tobacco companies with regard to advertising and product placement, as well as partners on Government, local authority and university programmes? In other words, should we de-classify these corporations as being in the sector at all?